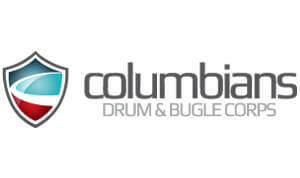 Two newly formed Open Class corps, Coastal Surge and the Columbians, have been approved to participate in the 2013 Drum Corps International Tour. Before corps are allowed to participate as part of the annual DCI Summer Tour, an extensive evaluation of the organization's business plan and strategy for future growth and self-sufficiency is conducted to assist corps in creating a strong foundation. 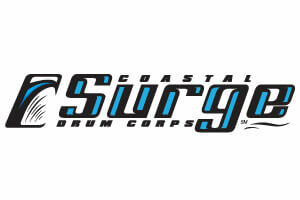 Coastal Surge Drum and Bugle Corps, led by Executive Director Matthew M. Shrewsbury, hails from Myrtle Beach, S.C., and launched from initial discussions about forming a corps in October 2012 to its first rehearsal camp this past February. The 51 members slated to perform with the corps during the summer of 2013 will be on the road for seven days total, allowing them to participate in three DCI Tour events in late June. "Our time on the road is going to be short, but we hope that it will be a great learning experience for us and help us to grow, expand our tour in the coming years, and really operate as effectively and efficiently as possible," Shrewsbury said. Shrewsbury, who cited borrowing and purchasing equipment as one of the challenges of starting a drum corps from the ground up said, "We kept our membership dues around $450 this year so that anyone who wanted to participate could. We wanted to give them the best experience we could during our time together." Taking time to allow staff members to get to know each other and learn to work together was also a challenge for Coastal Surge to work through, but Shrewsbury said that it does get better. "Once you get the right people in the right place and the learning curve of working together is conquered, life gets a bit less stressful in that area." Coastal Surge's 2013 production titled "Into the Storm," will include original compositions by Joshua Hinkel and Justin Mabry, and depicts a journey from the calm before a storm to the clean-up after it passes. The Columbians, from Pasco, Wash., held their first rehearsal in November. According to Director Matthew Newbury, the corps is named after the Tri-City Columbians Drum and Bugle Corps, a group founded in the 1930s that ceased to exist more than 35 years ago in the mid-1970s. 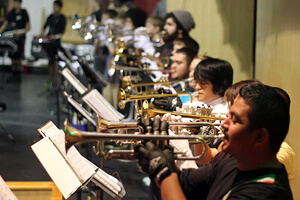 Newbury says that over the past 10 years, high school marching band programs in the Tri-City area have expanded, leading to growth of parent volunteer groups and committees which have come together to create support to get the Columbians started. "The thing that you live and die for in drum corps is membership, and it's been a great thing that we've had such a strong turnout, Newbury said. "So far this year we've had about 110 kids show up at one time or another to experience drum corps." In order to recruit members, Newbury contacted local band directors and asked them to encourage students to join. The corps' 2013 membership will be made up of approximately 65 performers, both local and nonlocal, who come from 12 different schools. of their first rehearsal camps in December. 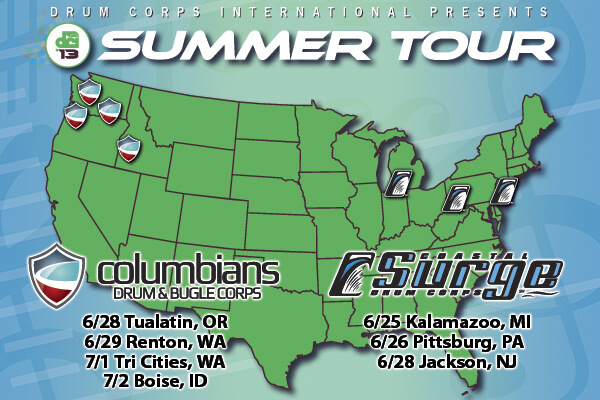 The corps plans to participate in DCI Tour events this summer in Portland, Seattle, its hometown Tri-City area, and near Boise. Like Coastal Surge, the Columbians will follow a modest tour in their first year to keep costs low. According to Newbury, the corps members' tour fees for the year (just under $500) will underwrite the corps' entire 2013 tour. "One of my goals initially as we brought the corps back together is to figure out a way where disadvantaged youth could gain access to drum and bugle corps, so we've created a very cost-effective model this first year," Newbury said. In addition to managing the corps, Newbury, a former staff member for the Blue Knights, is volunteering his services as a visual designer and music arranger for the 2013 season. The Columbians' production, "A River Runs Through It," includes Igor Stravinsky's "Firebird," Eric Whitacre's "October," and a Celtic folk tune known as "Dulaman," along with original themes composed by Newbury. "We're in an area here where we have the convergence of three major rivers [Snake, Yakima, Columbia]," Newbury said. "There's a lot of history of Lewis and Clark and the frontier element, and we'll tie into that a little in our show." Coastal Surge and Columbians will both make short regional tours in 2013 beginning at the end of June. The directors of both Coastal Surge and the Columbians said that a major goal is growing their corps' base of support in the coming years. "I'm hoping for a bright future for us and that we can continue to create a regional opportunity for kids here," Newbury said. "Rather than losing drum corps, I hope that we can expand by one." "We would like to experience steady growth over the next few years and expand our tour, giving the Coastal Surge experience to many young people from all over the country," Shrewsbury said. DCI Open Class Coordinator David Eddleman said that he is excited to see these two new corps get their starts. "Open Class corps who remain active and successful have some common traits," Eddleman said. "They operate within their means, they provide a quality experience for their membership, and they know their recruiting base. These groups are putting out great performances and they are doing it on modest budgets."